For the past few years, I’ve read through the bill summaries to find out about the bills being proposed that affect our money, education, and rights. I rely on these summaries to accurately reflect the legislators’ intentions. This year, I decided to highlight a select number of bills covering the issues that I think need the most consideration and debate. Over the last two weeks, I focused on significant tax, education, and business/economy issues to watch. This week, I’m wrapping up my 2018 legislative review by looking at 3 noteworthy bills that affect our freedoms and rights. If I’ve missed any important bills, please let me know! * More rights for voters. Every year, there are proposals like HB962, HB1202, HB1365, HB1430, HB2616, HB2662, SB832, SB833, SB2313, SB2723, and SB2725 that provide for direct initiative (where registered voters can force a public vote on an issue), popular referendum (a direct vote on a particular issue), and recall (a direct vote to remove an elected official from office). Only HB1202 calls for all three. I believe these rights would make legislators and elected officials more accountable to voters, and would encourage voter participation. A major concern is that elections could be distracted by unreasonable or frivolous petitions. One solution would be to require petitions to be reviewed by the Hawaii State Legislator’s Legal Counsel – before petitions are circulated. Another solution would be to limit the number of new or revised bills that legislators can submit each year – and limit the number of variations on the same proposed bill. This could increase the time for public debate, and reduce the amount of legislative paperwork. * More opportunities fir citizen legislators. On a related note, every year, legislators discuss term limits, and fail to take action. HB411, HB1710, SB827, SB828, SB2486, and SB2724 would limit the terms of members of the Legislature. If we want to increase voter participation and encourage people to take an interest in government, we need to make room for more people to participate in government. Term limits could help by increasing the number of available candidates. * End of life rights. There are several bills supporting End of Life or Aid in Dying choices, such as HB150, HB201, HB550, SB357, SB1129, and SB2727. As long as it doesn’t harm others, I don’t think we can tell people how to live their lives – or end it. The choices of people who are facing a terminal illness, or caregivers for someone with a terminal illness, should have greater consideration. For the past few years, I’ve read through the bill summaries to find out about the bills being proposed that affect our money, education, and rights. I rely on these summaries to accurately reflect the legislators’ intentions. This year, I decided to highlight a handful of bills covering different issues that I think need the most consideration and debate. Over the last two weeks, I highlighted significant tax and education issues to watch. 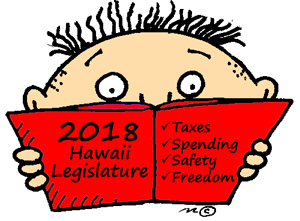 This week, I’m highlighting three bills in the 2018 Legislative Session that could have a huge impact on Hawaii’s business and economy. * The Good: Attracting international sports events. We need to continue to attract sports events and other industries to Hawaii, so that we decrease our dependence on tourism and the military. I think that Hawaii is well-positioned to host statewide sporting events as well as international sporting events and tournaments. We could attract an international yacht race or mountain marathon. I am uncertain about whether it’s worthwhile to attract national sporting events like the Pro Bowl or National Football League preseason game, because of the distance and expense involved, but that’s for the Hawaii Sports Task Force to decide. I’m also not sure there needs to be a separate Task Force, instead of the Hawaii Tourism Authority working with Aloha Stadium, but maybe it’s a reporting issue. * The Bad-Ugly: State jobs for everyone. Some legislators want to establish a task force to study the “feasibility” of creating a “public option” to provide jobs for all in the State of Hawaii. HB1992 attempts to address the complicated issues of unemployment, under-employment, and discouraged workers. It would examine whether government could guarantee Hawaii residents over the age of 18 a job with the State government. I have serious concerns about this proposal. Can we afford it? This year, legislators are raising taxes, even though there is a budget surplus. Will it solve a problem? Giving everyone who can work a job may lower the number of people who are unemployed, and improve Hawaii’s unemployment rate, but it will create a host of new problems. How would a guaranteed job affect students’ motivation to learn and employee’s motivation to work? Can we maintain it? We might be able to maintain it by cannibalizing private sector jobs. But hiring more public employees means finding more work for those employees to do, which means passing laws that increase the size and scope of government. * The Debatable: Minimum wage. Every year, the legislator proposes multiple bills that adjust the minimum wage. Some bills increase the minimum wage incrementally, like SB2013 raising the minimum wage by $1 every year for five years until it reaches $15 per hour. Other bills increase the minimum wage all at once, like HB5, ripping off duct-tape, raising the minimum wage to $15 in 2021. Here’s a thought experiment: What do you think would happen if there were no minimum wage? Imagine that the State of Hawaii repealed the minimum wage in 2019. Would businesses dramatically lower the hourly wage they pay employees? Would businesses quickly renegotiate salaries? Would there be no change to the hourly wage? Or maybe no change in 2019, but no pay increases in the next few years – or ever? Would employees quit their jobs or go on strike? Would businesses lower their prices (okay, probably not) or increase prices less frequently? Chanters descended from the twin curving staircases, their soaring voices filling the rotunda of Ali‘iolani Hale. Barefoot, they led the way through the open doors of the restored 1913 courtroom. We followed silently and sat in hard wooden benches in front of a judge’s bench. Recently, I attended a performance “Mai Poina: The Annexation Debate,” an eloquent and insightful reenactment that presented the background of Hawai‘i’s annexation through the words of people involved in the debate. Emma Aima Nāwahī, Ke Aloha Aina newspaper editor and confidant of Queen Lili‘uokalani, and James Keauiluna Kaulia, president of Hui Aloha ‘Āina, greeted each other after a long absence, wondering why they have returned. They drew in the audience by acknowledging us, and realizing that they have been called back for a purpose: to educate us about the events leading up to Hawaii’s annexation in 1898. Dressed in period costumes, performing in a historical courtroom, Emma (played by Karen Kaulana) and James (played by William Murray) began talking about the annexation debate – using the power of their voices and first-person accounts to walk us back through history. They took us through the so-called “bayonet” constitution of 1887, signed by King Kalākaua, Queen Lili‘uokalani’s attempt to restore power to the monarchy, and her subsequent overthrow in 1893, to the efforts of Native Hawaiians to organize, petition, and send delegates to the U.S. Capitol to oppose annexation. They were joined by other historical figures, such as William O. Smith, who played a role in the creation of the Republic of Hawaii, and Senator John Tyler Morgan, U.S. Senator from Alabama who strongly supported annexation. They presented their side of the debate: that the monarchy was ineffective, that Hawai‘i was strategically located, that America needed to ensure their power in the Pacific, and that foreign powers like Japan might seize Hawai‘i – against the wider American policy of nation-building. With minimal props – chair and podiums – and nothing to distract us from the power of their words, the cast brought to life the emotions, determination, and conviction of the people involved, on both sides of the debate. Karen Kaulana’s clear, incisive voice echoed in the courtroom, a powerful complement to William Murray’s smooth, confident baritone. In the discussion afterward, we were fortunate to have some knowledgeable audience members who started a discussion about the legality of a Congressional Resolution, whether an attempt to write a new constitution can be considered treason, and how students today are learning about both sides of the annexation debate. We all received an informative viewer’s guide with a timeline, historical photos and illustrations, articles, and the text of the 1897 Resolution Protesting Annexation so that we could take the discussion home. 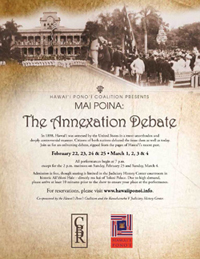 “Mai Ponina: The Annexation Debate” was free and open to the public, presented by the Hawai‘i Pono‘ī Coalition, a consortium of Native Hawaiian-serving organizations. What did you learn about Hawai‘i’s annexation in school? How different was it from what students learn today? What can or should be done to address the annexation debate? From community organizing for better conditions, to her first campaign as Marin County Board of Supervisors, then to the California State House of Representatives and US Senator from California, Barbara Boxer’s career is extraordinary. Boxer shares anecdotes from her childhood and reveals “the core values I’ve carried with me throughout all of my political career.” The first value she talks about: Never compromise about doing the right thing. And the guideline that matters most: Be authentic and stay authentic. Her love of singing, and the poetry and lyrics that she wrote, show us her more personal, everyday side. Idealistic, passionate, and energetic, she writes candidly of personal victories and failures, as well as political allies and opponents. One of her biggest legislative accomplishments is federal funding for after-school programs. I admire her courage in taking a stand on unpopular issues and her conviction – even if I don’t always agree with her policies or her clear partisanship. Boxer rarely acknowledges the good choices or good intentions of Republicans, while highlighting Democrat achievements and downplaying their mistakes. 1) Don’t take defeat personally – run for election again. 2) Personal relationships matter in getting support for bills. 4) Be patient – it can take years for a bill to become a law. 5) Thank colleagues, share credit, and be gracious in victory. 6) Keep your sense of humor, especially when dealing with apparently intractable problems. 7) Don’t respond to your opponent’s garbage by slinging it back even harder. 8) Be forgiving and be willing to take risks working with colleagues. 9) When you hold a minority position on an issue of conscience, it’s your duty to speak out, even when you’re taunted, even when it looks hopeless. 10) Even after an emotional disagreement, we must come together for the good of the country. 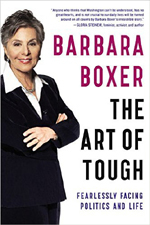 In some ways, “The Art of Tough” is Boxer’s legacy autobiography; she includes her top 50 legislative accomplishments. She vows to continue to be active in public service, outlining a long list of “legacy issues” that she is committed to since her retirement from the US Senate in 2017. For more information about “The Art of Tough,” visit the website at www.artoftoughbook.com. You are currently browsing the Better Hawaii weblog archives for March 2018.